3:58 a.m. — A resident in the 700 block of S Market St reported a friend fell while sleep walking and possibly broke their leg. 6:18 a.m. — Report of a disabled vehicle in the roadway on State Route 61. 10:22 a.m. — An employee of Donley Ford on Charles St reported a tailgate had been stolen off one of the trucks. 11:05 a.m. — A caller reported an altercation at a traffic stop in the 400 block of HWE. 11:29 a.m. — A resident of W Atwood St reported possible activity in a vacant house. 2:30 p.m. — Resident of Second Ave complained that a neighbor was leaving junk or trash on their property. 3:58 p.m. — A resident of Cedargate Apartments complained that people from another complex were throwing trash in their dumpster. 4:51 p.m. — Police assisted with a disabled vehicle on Mansfield St.
4:55 p.m. — A resident in the area of HWE and Pounder Ave reported two pit bulls loose in the area. 6:54 p.m. — A male was given a warning for intoxication in the 900 block of E Walnut St.
8:28 p.m. — Caller reported hearing a possible gunshot in the area of South St.
12:24 a.m. — A resident of Crew Ave complained about dogs barking loudly. 1:03 a.m. — A female was arrested and transported on a warrant from the Crawford County Sheriff’s Department. 1:28 a.m. — Resident in the 300 block of Sherman St complained that loud music from a neighbor had woken them up. 5:05 a.m. — An unconscious male was reported at Hometown Inn on Portland Way N.
10:25 a.m. — Report of 2 males hitting a side mirror on a car in the AmVets parking lot on HWE. 2:52 p.m. — Caller reported a possible overdose by a male on Dawsett Ave.
4:23 p.m. — A resident in the area of Sherman and Columbus streets reported juveniles in the area setting off fireworks on front porches. 4:52 p.m. — An employee of Drug Mart on Carter Dr reported a theft in the store. 8:32 p.m. — Police responded to a domestic dispute in the 300 block of Gill Ave.
11:02 p.m. — Resident of Sherman St reported a vicious black dog in the area. 12:35 a.m. — Police were informed of two suspicious males in the area of Gill Ave and Payne St.
9:09 a.m. — A non-injury accident was reported by St Joseph’s Church on Liberty St.
12:15 p.m. — Caller reported a malfunctioning traffic light at the intersection of Church and Market St.
3:23 p.m. — A non-injury accident was reported near Burger King on Harding Way W.
6:41 p.m. — Report of a suspicious vehicle in the area of Heise Park. 7:27 p.m. — Police responded to a domestic dispute in the 500 block of E Church St.
10:14 p.m. — A resident of Crawford Manor Apartments notified police that someone was in their neighbor’s apartment while they are on vacation. 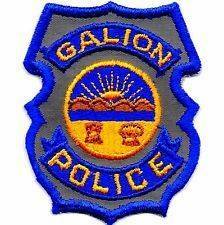 1:43 a.m. — Police responded to a motion alarm at Galion Middle School. 1:22 p.m. — Caller reported a suspicious male in a vehicle on Portland Way N.
2:14 p.m. — A female in the 200 block of N Union St was referred to Pastor Ash for counseling. 5:15 p.m. — Galion Public library notified police of three juveniles trying to enter the library who are not permitted in the building.